I have 2 Sony A5000's for my stereo rig. And 2 IR shutter releases to sync up the shutters. Looked like all was working just fine until I uploaded some stereo action images to my computer and starting layering them for 3D alignment. fast movement is always out of sync. Did some heavy internet research and discovered that this is a known issue with CMOS digital cameras. Its not the remote shutter release. Apparently the rolling shutter that actually captures the image is never really synced with the other camera. not matter what you do, the two images are almost never taken at the same time. We're talking fractions of a second, but its enough to make action shots worthless. even fluttering flags and water falls never match up. this is sad. The solution seems to rely on $400 gadgets like lanc sheppard and software hacks like stereo data maker, many of which only work on outdated digital cameras. My question is to all of you stereo rig experts and hobbyists. How have you dealt with or overcome this issue? Is their an affordable solution? Or do you just avoid action shots all together? Lastly, do any of you use the new Sony mirrorless cameras like mine, and is there a tool made the precisely sync the two rolling shutters? I am using Canon S110 cameras (the S110 from 2012, not the ancient Canon Elph S110) and they are synced using modified CHDK code to within 0.3 milliseconds. (The Canon S110 are available on Ebay for well under $200US each and have pretty good image quality for a P&S, though not as good as a Sony A5000 of course). They are controlled through a master/slave configuration so the aperture/iso/exposure etc. settings are synced between the master camera and slave camera(s) as is the shutter sync (communication is via the autofocus led which is connected to the slave cameras' center battery terminal (normally for thermistor input) through a photo-diode with no modifications of the camera required). The modified CHDK code does work well enough but I haven't completely finished adding features to it yet. I don't think it is necessarily to do with the fact that it is CMOS-based, I'm pretty sure rolling-shutter only matters during video when the physical shutter is open all the time or does the Sony A5000 being a mirrorless not actually have a physical shutter? It is most probably similar to the arbitrary delay in processing between the camera beginning the shot and the shutter actually opening on the Canon P&S cameras, which someone on the CHDK forums got around by writing some code to get the cameras to pause just before opening the shutter until a sync signal was received by both cameras (which I then used in the modifications I made). 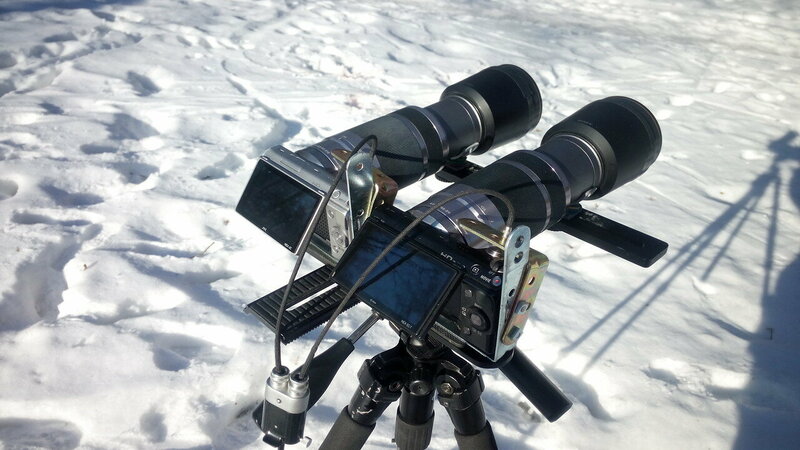 Not sure if a similar solution exists for Sony cameras though. rucnd3d wrote: I have 2 Sony A5000's for my stereo rig. But did you measure the time-difference between your exposures? If you just short-circuit remote-release terminals of two cameras, it doesn't guarantee synchronisation. The IR release should be even worse (and I didn't know A5000 supports it). We are developing a more or less serious dual-camera solution, and with a delay circuit we are able to achieve the difference within 10 milisec. Less than that doesn't appear to be reasonably feasible - there are deviations in a camera itself. 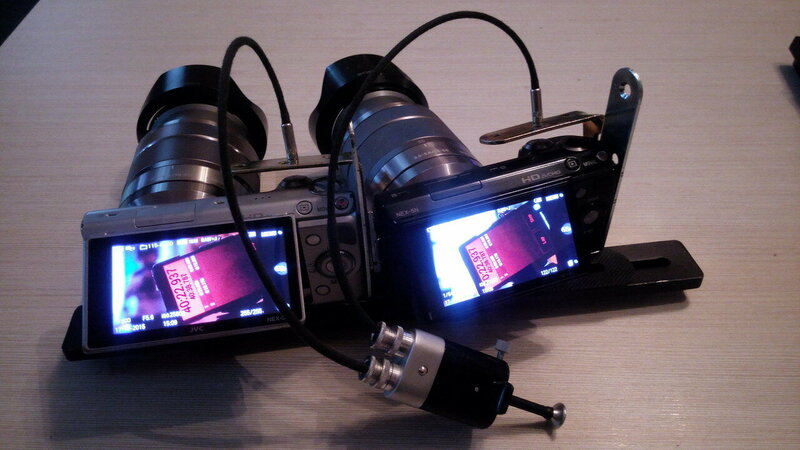 Our rigs have two Sony E-mount cameras, not necessarily the same model. If you need action shots, flash is the way to go. Make the exposure longer than your synchronisation error, or course. 57f745ea8884280a06000004 wrote: But did you measure the time-difference between your exposures? If you just short-circuit remote-release terminals of two cameras, it doesn't guarantee synchronisation. The IR release should be even worse (and I didn't know A5000 supports it). I get the flash photography workaround. Open both shutters and let the flash paint the picture. Did some action shots of pets this way, but it has to almost totally dark to do it. The A5000 only has the multi port, and I bought 3rd party IR remote that plugs into multi port to remote trigger. Can you/anyone explain this delay circuit? And is it something I can get use for my A5000 cameras? I'm working on my own 3D rig. I found 2 alternatives for what I want: the Lumix FZ300 or the FZ1000, sure the fz1000 is better, but is more weight to carry on. I have planned all components but I don't know where to find a duplicator for remote cable. The cheapest, and free synchronization is Stereo Data Maker software, based on CHDK. It is for a selection of Canon cameras but that list includes the EOS M3. Sychronization is excellent. Freeze splashing water etc. A more expensive solution is using a pair of Samsung NX1000 or NX1100 cameras. These can be linked with a patched pair of remote cables. The drawback is that these cameras are now very scarce and the prices have jumped quite a bit since it was discovered how well they work on stereo rigs. Last weekend two cables (male and female) arrived from China to me, for the multi-terminal port of the latest models of Sony cameras. With a little help from my friends (as the Beatles song of a well-known electronic store in Elche, now I can confirm that these two cables can get a perfect synchronization (no needing an external trigger) in, at least, three Sony Alpha cameras (A5100, A6000 and A7S). I think that can be also possibly in other two dozens of Sony cameras models (the Alpha and ... also the Cyber-Shot?). I am very excited because, suddenly, I have the possibility of obtaining extraordinary 3D equipment, very powerful and cheap, and much better than any new 3D camera, because these Sony twined cameras allow shooting with a variable stereobase (not possible with any future two-lens camera). As we all know the exposure depends on three inter-related variables (aperture, speed and ISO), and also the depth depends on other three inter-related variables (stereobase, focal distance, and distance to near object). b) decreasing the focal distance. It think can be absurd to reject the stereobase of this Sony stereo rigs, (and can be a obvious non sense to mutilate the cameras ! ), because we not need a 6.5 cm stereobase: we only need to change the lenses (searching other focal distance) for compensate that. “the biggest difference id the Sony uses a proprietary multi-port connector for the focus and shutter pins. It's much harder to find than a standard USB connector but can be ordered online”. I not know if the synchronization works well at all the Sony cameras with multi-terminal port. I only can confirm the sync with 3 models indicated above: A5100, A6000 and A7S (until ISO 400.000!). In any case, each 3D photo lover can make the appropriate checks, only under their own risk. Now (May 1) a new era in 3D photography begins, (at least for me, excited and happy): The Sony Multi-terminal Era. I saw Randy's Photo's of his A5100 rig and got inspired real fast! I spliced my 2 seperate triggers into one trigger. Now am doing extensive testing but it looks like both cameras are very well synced up! Very exicited about this.